SCOTTSDALE, ARIZ. – Jan. 17, 2017 – Craig Jackson’s Barrett-Jackson, The World’s Greatest Collector Car Auctions®, announced today that Grammy award-winner and international music icon Justin Bieber will auction his custom Ferrari 458 Italia F1 Edition during the 46th Annual Barrett-Jackson Scottsdale Auction, to be held Jan. 14-22, 2017, at WestWorld of Scottsdale in Arizona. 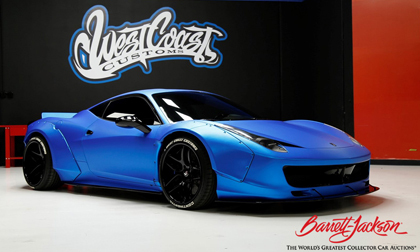 The international music superstar’s Frozen Blue 2011 Ferrari 458 Italia (Lot #1372) was built by Ryan Friedlinghaus and West Coast Customs of Burbank, Calif.
Justin Bieber’s 2011 Ferrari 458 Italia F1 Edition (Lot #1372) was built by West Coast Customs. The exterior is wrapped in Frozen Blue and fitted with a wide-body kit by Liberty Walk, which includes custom fender flares, front splitter, side skirt splitter and a rear wing. The interior includes a custom 2,000-watt 10-inch subwoofer with matched MB Quart separates. The factory custom interior was built to Bieber’s specifications. West Coast Customs new TV show will premiere on Velocity on Jan. 24, 2017.